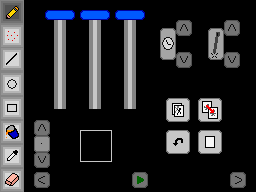 Flipbook is a full featured MSPaint-like drawing program with flipbook capabilities. You can draw upto thirty frames of animation using eight drawing tools and the DS's full spectrum of colors. The program is pretty simple and I tried to make everything very intuitive, but here are some things you should know. First off, you'll need to adjust the pressure setting (top right corner of the screen) which will filter out low pressure touches which are usually innacurate. If you find the pen jumping when you try to draw, turn it down-- if you have to press hard or your touches don't register at all, turn it up. Also, only use the fill tool inside of objects (don't fill the whole screen with it). You can also turn on a ghost copy of the last frame (for tracing when animating) by pressing the button that looks like two pieces of paper on top of each other. Flipbook Neo Flash Compo 2005 Edition NEWEST!